There are more reasons than ever to flip over burgers as they go gourmet. SEEMS simple enough: grill a piece of meat, slap it between two buns, pile on some lettuce and a tomato slice or two, slather the whole thing in mayo, and voilà! A burger. For most of us, the first introduction to this humble meal probably came from a fast food outlet or our own homegrown roadside burger stalls. And of course, what is an outdoor barbecue without a self-assembled burger or two? Over the last few decades, however, the unassuming burger has been quietly climbing the social ladder, popping up in menus of ritzy restaurants across the world as various award-winning chefs present their own twist on it. Along the way, the bun-and-patty combo is being dressed up in a variety of enticing ingredients and accompaniments, thus creating what is now popularly known as the gourmet, or designer, burger. It isn’t surprising that the all-American burger saw its initial renaissance in Manhattan, New York, in the early 2000s, where French chef Daniel Boulud introduced his version of the burger in his DB Bistro Moderne restaurant: a sirloin burger filled with braised short ribs and foie gras served on a parmesan bun, with the option of adding black truffles. This was soon followed by many other celebrity chefs wanting to put their own stamp on the burger, with renowned names like Bobby Flay, Hubert Keller and Emeril Lagasse all heading to the grill to design their own gourmet creations. The trend is the result of several different factors coming together. Dining out has increasingly become a more casual affair, and patrons are seeking out food that is of good quality yet down-to-earth. Food pundits further point out that with the global economic downturn, burgers provide a less expensive alternative to customers, while also giving bigger profit margins to restaurant owners. The rising popularity of comfort food on restaurant menus (think fried chicken, pies and sundaes) is yet another reason. Locally, the designer burger wave has slowly been on the rise, with several different eateries putting their own spin on the ubiquitous dish. 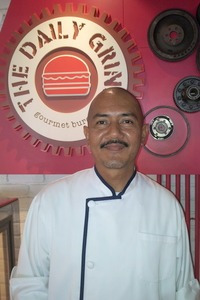 The Daily Grind (TDG) in Bangsar, Kuala Lumpur, was arguably the first restaurant dedicated to gourmet burgers, when it opened its doors in 2008. Selena Mak, TDG’s senior sales and marketing manager, says the designer burger trend is a result of the current generation of restaurant patrons placing more importance on the quality of the food. “People are acquiring better tastes and becoming more health-conscious; they may want a burger, but they don’t just want it to be fast food. People do want to eat better now,” she says. Leonard Park, who brought in the popular Singaporean franchise, Fatboys The Burger Bar, to Malaysia just this year, says Malaysians are now catching up with the global gourmet burger trend. “People are becoming aware of what goes into processed burger patties, and the difference between good pieces of meat and junk,” he points out. The Bee, which opened its first outlet two years ago, on the other hand, made gourmet burgers a part of its menu to fit in with its fuss-free philosophy. 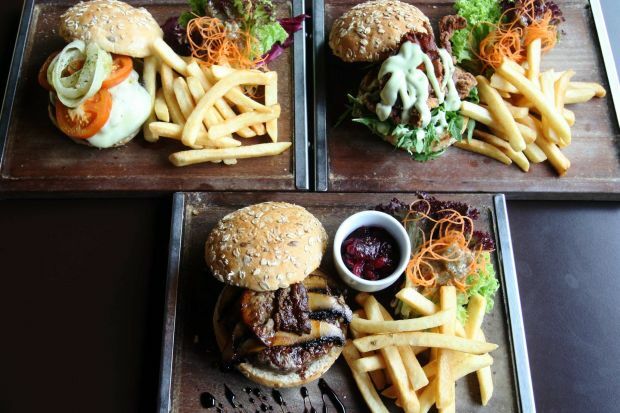 The Daily Grind head chef Shaari Musa combines different cuts of Australian beef to produce the perfect patty. Newest kid on the burger block, myBurgerLab, opened its doors just two months ago with one mission: to create the “just right” burger at affordable prices. And what exactly sets a gourmet burger apart from the run-of-the-mill stacks? The meat, for one. Instead of processed patties of indeterminate origin, designer burgers usually boast quality meat patties, often made in-house. The Bee, for instance, uses 180g Australian beef (or a grilled chicken thigh). TDG head chef Shaari Musa says he combines different cuts of Australian beef to produce the perfect patty, such as the tenderloin, striploin and knuckles, and uses no fat at all, opting instead to use egg whites. At Fatboys, which has made a name for itself with its pork burgers, Park says they combine different parts of the pig with a bit of fat and their “secret ingredient”, to produce a juicy and flavourful patty. Freshness is key. At myBurgerLab, for instance, the patties, made of grass-fed Australian beef, are ground and served on the same day itself. It is, in fact, almost unanimous that the meat makes the burger. “The patty has to be nice to the bite, juicy, and have the proper mince and mix to bring the flavour out,” asserts Park. To keep up with customers’ tastes, more exotic patties are often also available, such as the Downtown Tokyo Burger at TDG which is a deep-fried soft shell crab smothered in wasabi mayo and topped with rocket leaves served on a multigrain bun, or the Vegetarian Falafel Burger at The Bee, where a chickpea patty is topped with alfalfa sprouts, lettuce and tomatoes, drizzled with a mint yoghurt dressing and served on a white roll. To complement the patty, gourmet burgers usually also feature fresh, flavourful and good quality ingredients, from the vegetables and condiments to the bread. Sauces and toppings are often homemade, and the breads can be anything from the traditional sesame bun to an artisanal ciabatta – or in the case of myBurgerLab, a soft, fluffy bamboo charcoal bun that has proved to be a hit with patrons. The other aspect of the designer burger is the many incarnations it can take. Of course, there will always be a special place in everyone’s heart for the simple and traditional burger, but this also offer chefs the exciting challenge of experimentation. Hence, don’t be surprised if you see everything from aioli to peanut butter popping up in your burger (The Elvis at Fatboys features a bacon stuffed pork patty topped with grilled bananas and peanut butter!). “We like the idea of having people step out of their comfort zones and experiment with some unique burger concoctions,” says Chin, citing the example of their Seattle burger, where the patty is smothered in espresso-spiked umami mayo and topped with a fried egg. Shaari says once he hits upon a new idea for a burger, he expands upon it by thinking of what ingredients would go well together. The Bee adds a twist to the everyday burger,says Adrian Yap(left), who shows off a variety of burgers with head chef Miguel Hokama. “For the My Big Fat Greek Burger, for example, I thought about what meat would represent Greek food well, and decided on a lamb patty. And then I went with lots of Greek ingredients, like grilled eggplant and cucumber yoghurt,” he explains. Park says they come up with their burger creations by putting together familiar elements of a particular cuisine. “We have a Japanese-inspired burger in the works, where we combine elements like wasabi, teriyaki and seaweed. The key is to make sure they go together, and that the end result is interesting yet familiar to our customers,” he says. For Hokama, it is all about mixing flavours. When creating the Gaucho Burger, for example, he turned to Argentina for inspiration, and the result was a beef patty topped with chimichurri sauce, romaine lettuce, tomatoes and melted cheese on a ciabatta roll. “The flavours are from Northern Argentina, the ciabatta makes it different, and the citrus in the chimichurri gives a kick to the medium rare meat,” he explains. And if what you’re after is a classic burger (sans fancy toppings and stuffings), well, those are certainly still available, albeit with each restaurant putting its own spin on it. The Bee Burger comes topped with Italian turkey bacon, melted cheese, pickled cucumber, lettuce, tomatoes and garlic aioli, TDG’s Classic Beef Burger is served with homemade ketchup, mustard and pickles, and myBurgerLab’s version is a classic with sharp cheddar, oven-roasted tomatoes and lettuce. Fatboys, meanwhile, goes full throttle with the Fat Basterd, where your choice of double patties are topped with streaky bacon, cheddar, a fried egg and barbecue sauce (less intrepid appetites can opt for the Wimpy, which is the same but with one patty). So whether you prefer your burger with ketchup and pickles or remoulade and foie gras, just remember that there is more to the seemingly simple burger than meets the eye.